"How to Get Paid By Uncle Sam"
Hear About Several Different Electronic Invoice Inquiry Systems from DFAS,GSA, Treasury etc. During our approximate 3-4 Wide Area Workflow Lab learn how to submit your invoice electronically. Let us teach you some short cuts regarding templates and pre-population. Electronic Document Access allow you to view your contracts and modifications online. MyInvoice will allow you to view your invoice process online. At our workshop on Thursday afternoon you may meet one on one with our speakers to inquire about contracting or payment issues. There have been several times that our speakers have helped you correct your invoices and in some cases get paid within a week of our conference. Receipt, Acceptance, Entitlement, Pre-Validation, Reconciliation and ultimately the payment. MOCAS Data Share concept is expanding to other payment systems within DFAS. Learn how you can access accounting and finance records within DFAS. This data was not available to vendors/contractors in prior periods. Pre-validation threshold to drop 20 $2,500. Learn how this will affect your invoices being processed. DFAS Customer Service options and how to expedite your invoices through the entire process. - Learn about the different Payment Systems within DFAS and how their processes effect payments. MOCAS Entitlement, Procedures, Reconciliation, Close-Out, Cancelled, and Expired Funds. Procedures so that expired and cancelled funds may be re-opened so payment may be made. Receive a listing of telephone numbers and options to use so the problem invoice may be paid. Prompt Pay Act—Learn the steps necessary to get paid on time, and if not, learn how you can collect interest and additional penalties owed to you. Billing Procedure Differences for Army, Air Force, Navy, Marines, and other Defense Departments. LEARN THE MANY Different Invoicing Tools and How They Affect Your Payment and Invoicing Terms—Cost Vouchers, DD 250s, Commercial Invoices, Progress Payments, and Performance Base Payments. Learn how to use and access myInvoice to view the status of your invoices—Remittance and Reconciliation Data. Hear detailed information regarding invoice processing for your contracts and invoices being administered in Afghanistan and Iraq. MOCAS data and closeout procedures. The role of the Defense Contract Management Agency as it relates to acceptance which ultimately helps you get paid. Invoice approvals, payment processing, listing of telephone numbers for their finance centers, email addresses, customer service responsibilities, funding, reconciliation, elevation of a problem invoice. Prompt Pay Act-Learn the steps necessary to get paid on time and if not, learn how you can collect interest additional penalties owed to you. Billing Procedure Differences for Army, Air Force, Navy, Marines and other Defense Agencies. LEARN THE MANY Different Invoicing Tools & How They Effect Your Payment and Invoicing Terms-Cost Vouchers, DD 250’s Commercial Invoice, Progress Payments, Performance Base Payments. To provide presentation regarding their invoice and payment processing including Tungsten formerly OB 10. Please click the button to sign up for our email list. Start receiving emails for our upcoming conference dates. The information regarding the conference will include: location, topics, guest speakers, hotel information, and registration information. Email confirmations are provided to each registrant. Although unlikely speakers may change without notification. In the past this highly successful program has sold out fast! 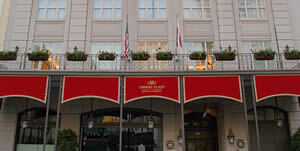 Conference to be held at the Astor Crowne Plaza 739 Canal St. @, Bourbon St, New Orleans, LA 70130 in the French Quarters. Reservations may be made by calling 877-408-9661. To receive our group rate of $121.00 per night plus 15.2% tax + $2 night occupancy tax, please make reservations by May 24, 2019 and identify yourself as attending FGRRB’s conference. Hotel will honor our special rate up to May 24 based on the availability of space. Hotel Cancellation Policy: Individual guest room deposits will be refunded if reservations are cancelled 72 hours prior to the day of arrival. Non-cancelled room reservations (those that do not have an appropriate cancellation number) will not be refunded. Registration fees, less a $95 cancellation fee, will be refunded for written requests received no later than 30 days before the start of the conference. No refunds will be allowed after that. Substitutions are permitted.